First Lady Melania Trump grows in popularity in more ways than one as her first name, scarce until recently, dramatically surged in popularity last year. In 2016, Melania was the 1650th most popular baby girl name in America, according to the Social Security Administration. A year later, the name jumped 720 ranks higher. Meanwhile, the first lady’s popularity has grown as well, garnering favorable opinions from 57 percent of U.S. residents, according to a May 2-5 CNN poll. That’s a significant improvement from the previous, Jan. 14-18, poll, when 47 percent had a favorable opinion of her. 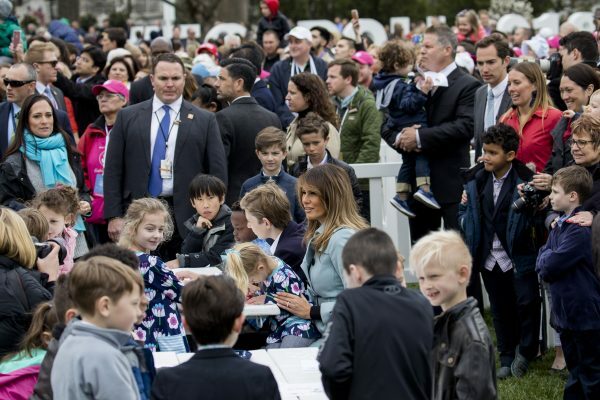 The first lady unveiled her official platform from the White House’s Rose Garden on Monday, May 7, focusing on the welfare of children. It was the first time she has officially laid out her formal policy goals as the first lady. Previously she had worked on combating a range of issues such as cyberbullying, neonatal opioid effects, social inclusion, and internet safety. Her campaign, dubbed “Be Best” will center on children’s wellbeing, social media use, and opioid abuse. President Donald Trump, also at the event, helped sign a proclamation declaring the day “Be Best” day, in honor of the first lady’s new platform. Earlier at the event, the president made remarks acknowledging the first lady’s role during the past year. Melania Trump has visited schools, hospitals, and families who were dealing with the effects of the opioid epidemic. Melania Trump has always shown interest in helping children. Just last month, she turned the Blue Room at the White House into a classroom and invited middle-school students to discuss the thoughts and issues that they face. The first lady herself has a 12-year-old son, Barron Trump. The most popular baby girl name is still Emma, claiming the top rank since 2014 and consistently reaching top three since 2003. The Epoch Times’ Bowen Xiao contributed to this story.